William James Bradley was born on 14 April 1881 at Alexandria in Sydney, son of Michael Bradley, a builder, and his wife Bridget, née Clerkins, of Golden Grove, NSW. On 25 January 1922 he married Coralie Viola Maloney, daughter of Pierce Goold of Cobar and Randwick. He died at Lewisham on 1 July 1957, aged 87. His funeral proceeded from St Thomas Roman Catholic Church to the Old Catholic Mortuary at Rookwood. Bradley gained his BA (1915) and LLB (1919) from the University of Sydney and was President of the University Union in 1919. He worked in the Crown Solicitor’s Office from 1917 to 1918 and was admitted to the NSW Bar in 1919. He became a lecturer in commercial and industrial law at the Metropolitan Business College in 1924 and at the University of Sydney from 1926 to 1937. He became a KC in 1934 with a practice in Selbourne Chambers in Sydney’s Phillip Street. 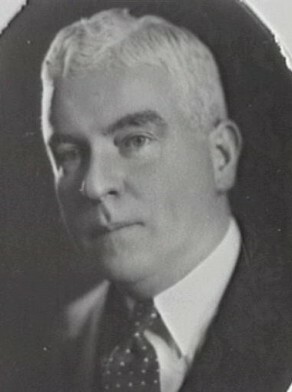 Bradley was a Director of many companies including the Electric Light Supply Corporation Ltd, Sussex Ltd, Australian Picture Palace Ltd, Film Players Corporation Ltd, Clarence Oil Exploration, and NRMA Insurance Ltd. His club memberships included Tattersall’s, University, R.A.C.A., and Concord Golf Club. He served as Captain with HQ 10th Division in the early years of World War 2. William Bradley was commissioned 2nd Lieutenant with the A.I.R. in 1910, rising to Captain of the 24th Battalion A.M.F. From 1939 to 1942 he was Captain and Adjutant of the Australian Legal Department 1st Cavalry Division L.S.O. From 1951 to 1952 he was President of the Royal Armoured Corps Association. He was President of the R.A.C.A. 1934-36, the NSW British Royal Empire Society 1951-55, and the National Opera of Australia 1954 to 1955. He was on the NRMA council from 1942. He was chairman of the Sydney Eisteddfod from 1940 to 1946, becoming Vice-Patron in 1947. Bradley was a Member of the NSW Legislative Council from 22 December 1940 to 22 April 1949. Bradley was Alderman for Fitzroy Ward, 6 December 1937 to 31 December 1948. He was a member of the Finance Committee, 1938-42 and 1944-47, the Electricity Committee, 1938-39 and 1941-42, the City Planning and Improvements Committee, 1938-41 and 1943-48, and the Markets Committee, 1942-43.